The two countries are supporting a collaborative effort spanning government, businesses, communities, and civil society in Peru to protect the natural systems – grasslands, forests, and wetlands – that can help safeguard water supplies today, and for future generations. Importantly, this new investment in natural infrastructure will improve water security not only for major cities such as Lima, Cusco, Arequipa, Piura, and Moquegua, but also for the small towns and rural communities in Peru’s highlands. From left to right: Alberto Barandiarán, National General Manager of SUNASS (Superintendencia de Servicios de Saneamiento, Peru’s national water authority/regulator); Lucía Ruiz, Vice Minister for Natural Resources Strategic Development-Ministry of the Environment; Gwyneth Kutz, Canadian Ambassador to Peru and Bolivia; Krishna Urs, United States Ambassador to Peru; Michael Jenkins, CEO of Forest Trends; Lawrence Rubey, United States Agency for International Development (USAID) Peru Mission Director; and Gail Cockburn, Canadian Embassy Development Director. Photo: USAID. 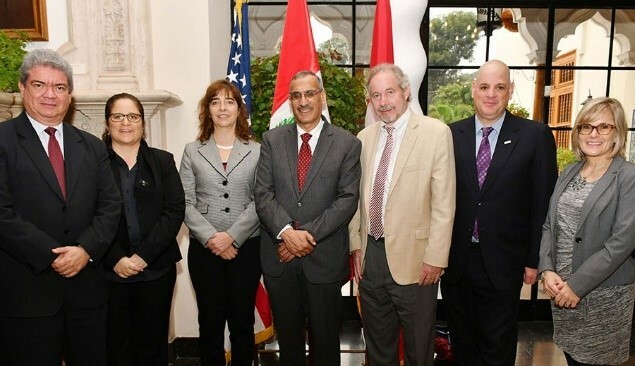 On June 15th, the Ambassador of the United States in Peru, Krishna R. Urs, and the Ambassador of Canada to Peru and Bolivia, Gwyneth Kutz, officially announced that the two countries together would invest US $27.5 million in the Natural Infrastructure for Water Security Project in Peru. While governments have traditionally turned primarily to “gray infrastructure” such as reservoirs, desalination plants, and floodwalls to manage water challenges, it is increasingly recognized that “natural infrastructure,” the natural systems that provide key hydrological services such as regulating water flows and preventing erosion, is an indispensable complement to address today’s water crises. In Peru, natural infrastructure interventions that are critical to water security range from wetland and forest conservation, to improving grazing and farming practices, to even restoring pre-Incan infiltration canals. In recent years, the country of Peru has initiated a rapid paradigm shift in its water sector to embrace natural infrastructure as a central pillar of its sustainable water resource management and climate change response. In less than a decade, Peru transformed its water sector from one in which water utilities could not make investments in watershed protection upstream of their intakes, to one in which all utilities nation-wide will allocate a portion of their user fees to watershed investments and climate change adaptation. The Natural Infrastructure for Water Security Project is building on this strong foundation to mainstream natural infrastructure approaches to reduce water risks such as droughts, floods, and water pollution, as well as improving climate resilience. The project aims to improve enabling conditions for investments; enhance the science and knowledge base for decision-makers; and build broad-based capacity for planning, implementing, and evaluating natural infrastructure. While the project works throughout the country, there is a particular focus on six watersheds: the Chira-Piura (serving the city of Piura), Chillón-Rimac-Lurin-Alto Mantaro (serving Lima), Quilca-Chili (serving Arequipa), Tambo-Moquegua (serving Moquegua), Vilcanota-Urubamba (serving Cusco-Piuray), and Mayo (serving Moyobamba). In these basins, project partners will work closely with local communities, watershed councils, businesses, and water utilities to implement natural infrastructure projects. With partners in the Ministries of Environment, Agriculture, Housing, and Women, as well as Peru’s national water regulator SUNASS, its National Water Authority (ANA), and local governments, communities, and businesses, Forest Trends leads the implementation team of CONDESAN, the Peruvian Society for Environmental Law (SPDA), EcoDecisión, and experts from Imperial College London. 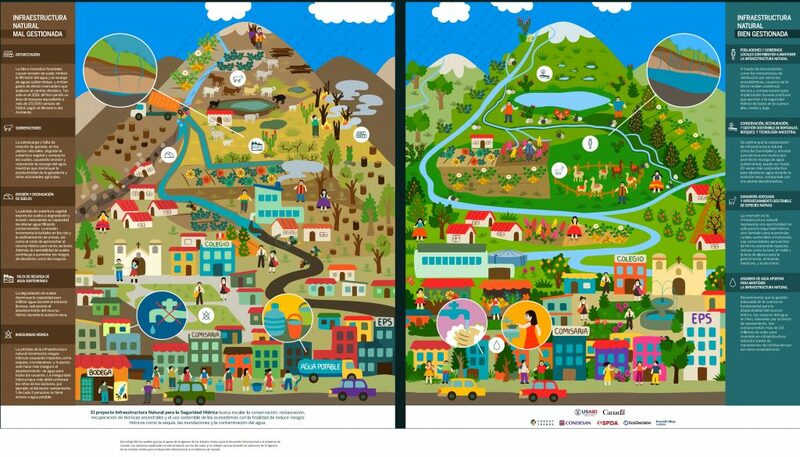 Infographic contrasting well-managed vs. impacted watersheds; the Project is communicating the benefits of investing in natural infrastructure for water security to diverse audiences in Peru with a variety of media – infographics, videos, newspaper articles, webinars, and podcasts. Image: Forest Trends, CONDESAN, SPDA, Ecodecision, and Imperial College London. The launch event in June illustrated the influence that the project is already beginning to have. The collaboration between Canada and the United States and their commitment to this major investment sends a strong signal to the international community: new approaches are needed for securing vital water sources and managing water sustainably for the long term. The event functioned as a convening for an active community of practitioners in Peru who recognize the potential of natural infrastructure strategies to protect water sources and improve the lives of rural and urban communities. Commitments to work with the project have been made not only by the water and sanitation sector including the ANA, SUNASS, and individual water utilities, but also by the agricultural sector. The Sierra Azul program, focused on water security and improved agricultural productivity and resilience for farmers, as well as companies from the beverage and mining sectors including the Coca-Cola Company, Cerro Verde, Lindley, AngloAmerican, and Backus, have all committed to work together with the Natural Infrastructure for Water Security project. The participation by leaders from the communities of Piuray-Ccorimarca reflects the importance the project places on rural and urban communities working together to protect water sources. In the Piuray-Ccorimarca watershed, communities in the upper basin have stepped forward to manage natural infrastructure under an innovative agreement with the water utility in Cusco, located downstream. The agreement ensures rural access to water and sanitation services, while providing sustainable economic opportunities for residents of the upper watershed and recognition for their role as water stewards. 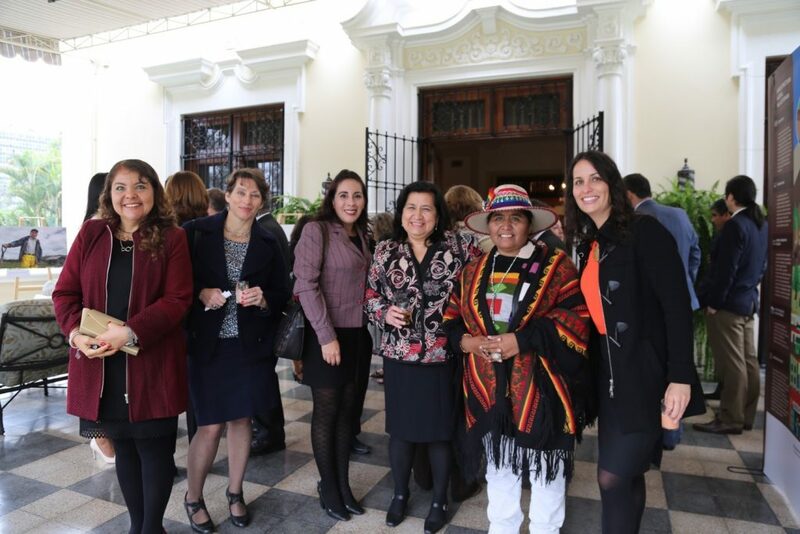 Women from across Peruvian society can play key roles in achieving water security and will be critical to realizing the vision of a water secure and resilient future. Photo: Arlene Villanueva. Bringing together diverse sectors around common interests is another benefit of the project; the same nature-based interventions that help secure water supplies, improve water quality, and manage water hazards such as droughts and floods also provide climate mitigation and adaptation benefits. For example, restoring forests or improving agricultural practices to manage erosion and other threats to drinking water quality also sequesters carbon, serving to mitigate climate change and providing resilience to its impacts. “Assessing the climate benefits of natural infrastructure investments by the water sector and evaluating the specific business cases that would drive investments from other sectors can create a unique model of cross-sector collaboration among water, climate, and forests,” according to Michael Jenkins, CEO and President of Forest Trends. The Project partners’ commitment to gender equality and strengthening the role of women in achieving water security was strongly reflected in the launch event. An explicit objective of the Project is to promote and empower women leaders at all levels, within communities, in watershed councils, in utilities, civil society, and municipal, regional, and national governments. Canadian Ambassador Kutz stated that “Women are key agents of change. Thanks to their knowledge and fundamental role in water management, they can contribute to finding innovative solutions.” Supporting the effective and equal engagement of women will be key to tapping the full range of human potential in achieving water security in Peru. This post was made possible through support provided by the U.S. Agency for International Development and the Government of Canada. The opinions expressed herein are those of the authors and do not necessarily reflect the views of the U.S. Agency for International Development or the Canadian Government.